Doris Day had a leg up on the competition in the 1950s. She held her own against Patti Page, Kay Starr, Teresa Brewer, Rosemary Clooney and the other top divas of the day. But Doris had another set of showbiz stars to duke it out with: Susan Hayward, Marilyn Monroe, Grace Kelly, Kim Novak and Elizabeth Taylor, to name but a few of the era's most popular actresses. Doris gave them all a run before her stock soared in the first half of the '60s, when she left the next group of screen sirens in her dust, including Debbie Reynolds, Sandra Dee, Shirley MacLaine, Julie Andrews and the persistent Liz Taylor, her closest competitor for the distinction of top box office star in America. Bottom line: Doris was/is a superstar...but then you knew that as soon as you read the first two words in this paragraph! While growing up in Cincinnati, Doris Kappelhoff took to dance, but an accident in 1937 (she was a passenger in a car when it collided with a train) derailed that ambition. Just 15 years old, it took over a year to recuperate, but damage to her legs made attempts at anything fleet-of-foot unlikely. Whiling away the many hours in bed during that long year, she took to singing along with the songs on the radio, singling out Ella Fitzgerald as her favorite. Before long she could keep up with the First Lady of Song on some of the trickiest of spontaneous scats. Later, her mother hired a voice teacher, Grace Raine, to help shape Doris's natural ability. Opportunities arose while she was taking those lessons. She sang on a radio show, Carlin's Carnival (no pay), broadcast Saturday mornings on Cincy's WLW, a high-power, clear channel station that covered most of the east and midwest. This led to a regular job at a local restaurant, the Shanghai Inn (slightly more than no pay). The amateur outings caught the ear of bandleader Barney Rapp, who contacted her, auditioned her, and gave her a job as a singer in 1939. He also suggested a name change from Kappelhoff to something shorter and easier to remember. "Day After Day" was one of the songs she sang with the Rapp band, so the decision was an easy one. Doris Day's career was under way. The next couple of years were a whirlwind in her professional, and personal, life. She sang for a brief time with Bob Crosby's band and by late 1940 had joined the Les Brown orchestra, making her first commercial recordings for Okeh Records before year's end, all the while carrying on a romance with Al Jorden, a trombone player from Barney Rapp's group. They were married and she left the Brown band and the business to become a wife and mother. Her son, Terry, was born in February 1942. The marriage ended shortly afterward (Jorden wasn't a faithful husband; there were other issues, but I'll just leave it at that). Barely out of her teens...and already Miss Day was a divorcee! At Les Brown's request, she resumed singing with his band. In late 1944 she was the featured vocalist on Brown's recording of a song he'd written with Bud Green and Ben Homer, "Sentimental Journey." It didn't take off right away and a follow-up 78 was released of the Mann Curtis-Vic Mizzy tune "My Dreams Are Getting Better All the Time," which became her first hit, and a massive one at that, spending several weeks at number one in April and May of 1945. Meanwhile, "Sentimental Journey" connected, as World War II had begun to unravel with the fall of the Third Reich in April and U.S. military started to anticipate coming home. The song knocked off the first Brown/Day record in May and rode the top of the charts through July, becoming a theme song of sorts ('Gonna take a sentimental journey, to renew old memories...') for the flood of returning troops that summer and fall. Doris and Les Brown were the hottest stars in music in 1945. 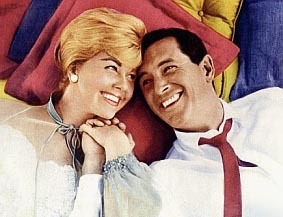 Les and Doris enjoyed several more hits over the next year, including "You Won't Be Satisfied (Until You Break My Heart)." Then...she did it again! Doris left the band, and show biz it would seem, to marry George Weidler, a saxophone player in Brown's employ...that is, until they were married; she quit...he got the boot. The marriage, like her first, was short-lived and in 1947 she signed with Columbia Records as a solo act (many singers in the later '40s, long under the restricting "featured vocalist" system, were claiming their independence from bandleaders in similar fashion). Prior to any solo projects, though, the label teamed her with Buddy Clark, an already-popular Hit Parade radio show singer and vocalist with Ray Noble's orchestra. Doris and Buddy lit up the summer of '48 with the cute-and-catchy "Love Somebody" and two other hit songs. The partnership, along with Clark's career, was disastrously cut short when he died in a plane crash in October 1949. Doris wasn't going to allow the illusion of happy married life get in the way of her career any longer; 1948 was her breakout year. She auditioned for Michael Curtiz (the Oscar-winning director of 1943's Casablanca, considered by many the greatest movie ever made) and won a starring role in Romance on the High Seas, a flashy, color Warner Bros. musical pairing her with Jack Carson. Her performance of Sammy Cahn and Jule Styne's "It's Magic" as the film's finale sparked sales of a million 78s, Doris's first bona fide solo hit. "It's Magic" received an Academy Award nomination for Best Song and she performed it on the Oscar broadcast, strictly a radio affair back then, on March 24, 1949 (although five more songs from her films were were nominated for Oscars through the years, she never again performed on the awards show...in fact, she seldom sang in public after the 1940s). A consistently popular string of musical films kept her in the public's favor the next few years as she gradually transitioned into dramatic roles. Hit songs came at a steady clip: "Again" in '49, movie tie-ins like "Canadian Capers (Cuttin' Capers)" from My Dream is Yours (her second film, again starring with Jack Carson), Richard Rogers and Lorenz Hart's "Bewitched," a top ten hit in '50, plus gimmicky numbers like "Hoop-Dee-Doo" (putting her in competition with versions by Perry Como and the Fontane Sisters and Kay Starr) and "I Didn't Slip - I Wasn't Pushed - I Fell," working with orchestra leader George Wyle as she did on many recordings in 1949 and '50. The singing and movie careers went hand-in-hand very nicely throughout the 1950s; at times it was hard to say which she was more accomplished at. Bob Hilliard and Milton DeLugg's uniquely appealing "(Why Did I Tell You I Was Going To) Shanghai" landed her in the top ten in 1951 (was she referencing the Chinese city or Cincinnati restaurant?) at about the time she took a third plunge and married her agent, Marty Melcher. The subject matter of her films varied, from Storm Warning (where she and Ginger Rogers went up against the Ku Klux Klan) to Lullaby of Broadway, a hit musical and top-selling album. "A Guy is a Guy," Oscar Brand's adaptation the World War II song "A Gob is a Slob" (in turn based on a two-centuries-old British tune, "A Knave is a Knave"), became one of her biggest hits in the spring of '52, the song's lyrics depicting a flirty-natured girl and how she snags a husband, possibly a reflection of the real-life Doris Kappelhoff. I'll See You in My Dreams became her first album to top the charts, then a duet with Frankie Laine, "Sugarbush," went top ten. Other duets were recorded that year with Donald O'Connor and Johnnie Ray. Calamity Jane, released in November 1953, was a box office hit in a Wild West setting. The musical supplied her with one of the decade's best-loved songs, "Secret Love," written by Paul Francis Webster and Sammy Fain. It was the nation's number one hit in February and March 1954, Doris's best selling solo single, and won the Oscar for Best Song. Next, she filmed a remake of the 1938 film Four Daughters opposite Frank Sinatra, while Frank's "Young-At-Heart" was in the top ten, his biggest hit since he'd joined Capitol Records the previous year. The song was so popular that Warner Bros. retitled the film, and it was released as Young at Heart during the Christmas season. 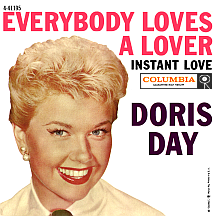 By then Doris had added another top ten smash to her successful run, "If I Give My Heart to You," written by Jimmie Crane, Al Jacobs and Jimmy Brewster. 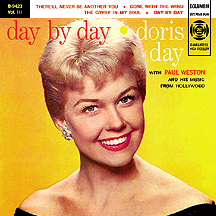 There were no major hit singles for Doris in 1955, but it was a banner year nonetheless. Taking her husband's advice, she opted out when her WB contract came up for renewal, instead letting Melcher's Arwin Productions place her with whichever studio made the best offer for any given project. Love Me or Leave Me, released by MGM, was strong at the box office during the summer months and scored six Academy Award nominations including Best Actor for co-star James Cagney and Best Song for "I'll Never Stop Loving You" (a minor hit for Doris) as well as a win in the category of Best Motion Picture Story. More significantly, the soundtrack album was a chartbuster, spending four solid months at number one from August through November. Alfred Hitchcock came calling, anxious to make Day the latest in a long line of "cool blondes" he preferred as his leading ladies. It was the only time Hitchcock ever remade one of his own films, taking The Man Who Knew Too Much (a 1934 pre-Hollywood Peter Lorre entry) and elaborately reimagining it. With an updated story line, the color version starred James Stewart and featured Doris singing "Whatever Will Be, Will Be (Que Sera Sera)," a top-of-the-chart near miss (cruising the top ten for four months in 1956, reaching number two at the end of August). 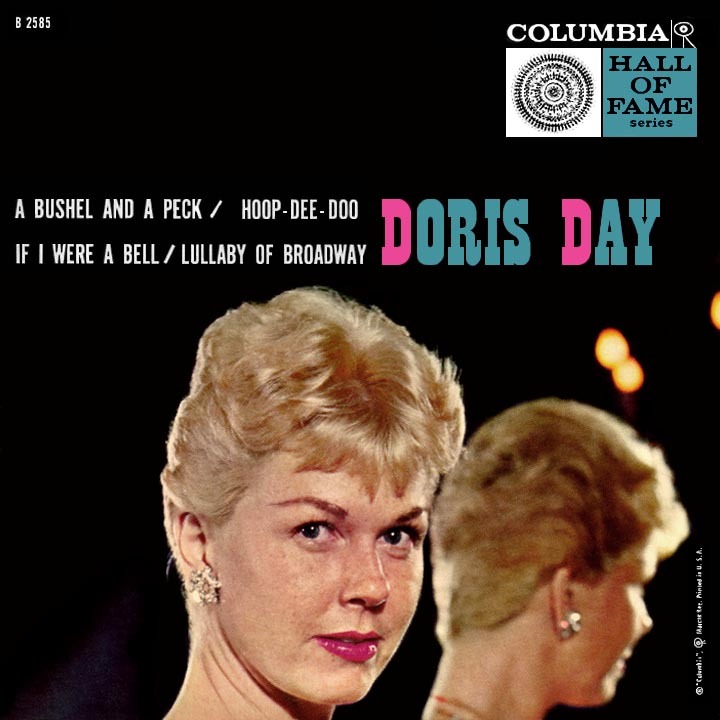 It also became an Oscar winner for composers Jay Livingston and Ray Evans, yet the song, definitively associated with Doris then as now, was performed on the Oscar telecast by Gogi Grant. Single releases were often the title themes of her films: "Julie" from the 1956 thriller co-starring Louis Jourdan (creepily playing against type), "Teacher's Pet" in '58 with Clark Gable, revealing Doris's previously hinted-at flair for romantic comedy, and "Tunnel of Love," directed by Gene Kelly and featuring the usually-demented Richard Widmark in a comedic role. The biggest and best of her late-'50s hits wasn't from a film, though. 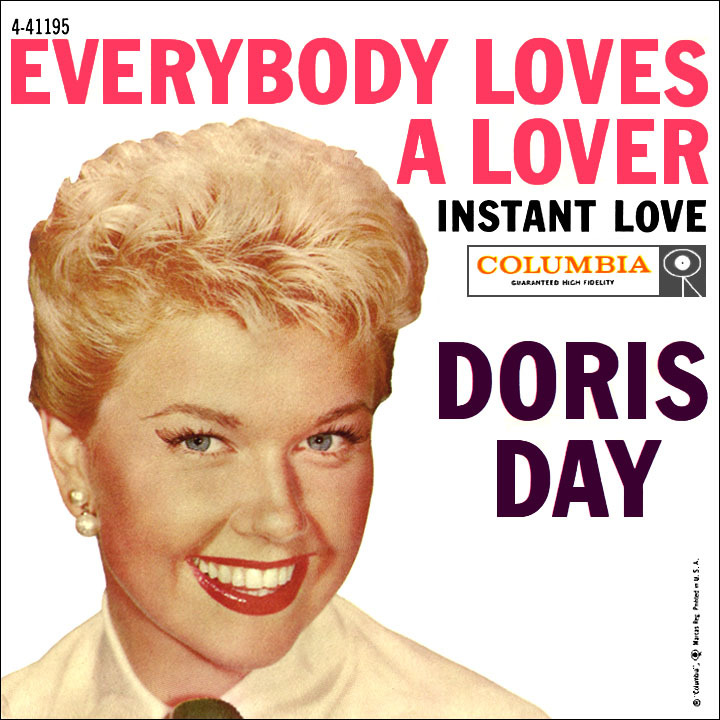 "Everybody Loves a Lover," written by Robert Allen and Richard Adler, was a double-tracked Doris delight of egotistical proportions, all in good fun, of course ('Who's the most popular personality? I can't help thinkin' it's no one else but me! '), with overlapping verses ('...wow, I feel...just like a Pollyanna!'). In the summer of 1958 it was her last major hit, just as her movie career was on the verge of new heights. 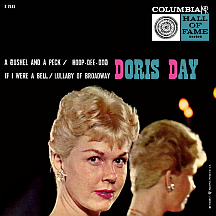 The first Grammy Awards were handed out in a May 1959 ceremony for the year 1958; Doris received her one and only nomination, not for "Everybody Loves a Lover," as one would expect, but, oddly, for a version of "The Sound of Music" unrelated to the standing-room-only Broadway musical starring Mary Martin. Then Doris met Rock and Pillow Talk ensued, bringing her a new level of fame as a skilled comedic actress. Teaming her with heartthrob Rock Hudson brought unexpected results, packing audiences into theaters in the fall of '59. Come Oscar time she received a nomination for Best Actress, a difficult feat considering the Academy's aversion to comedy (the other four nominees gave intensely dramatic performances). The film's success led to more outings with Hudson (Lover Come Back in '61, Send Me No Flowers in '64), ranking them among the more fondly-remembered comedy teams in movie history. 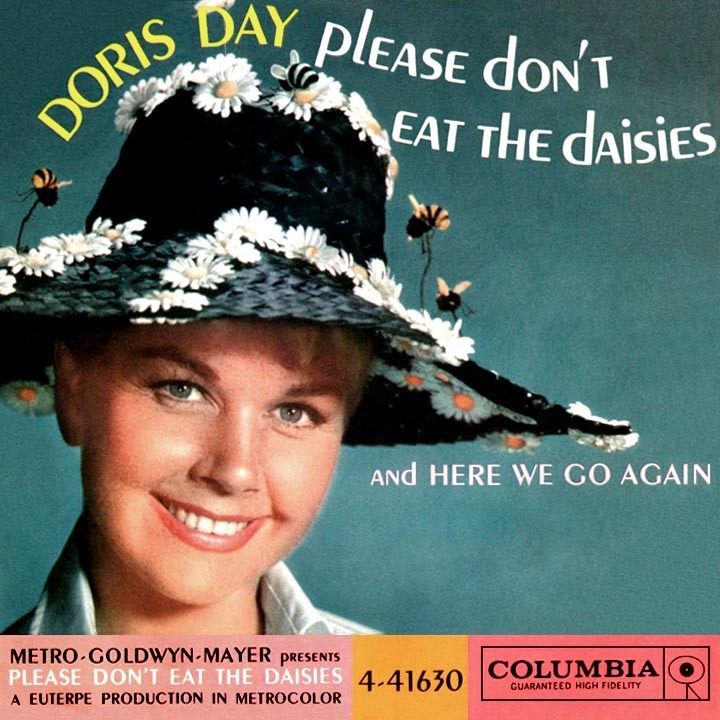 In between she made the well-received Please Don't Eat the Daisies with David Niven; the family-friendly film featured the minor hit "Anyway the Wind Blows." Romantic comedies became her forte; she was matched up with Cary Grant (That Touch of Mink, 1962), James Garner (The Thrill of it All and Move Over, Darling, both in '63) and others. According to annual polls by U.S. film exhibitors, Doris was the number one box office star between 1960 and 1964, pummeling the competition four of those years and ranking behind only Elizabeth Taylor and costar Hudson in 1961. The theme for "Move Over, Darling" failed to make it to the radio airwaves upon release in the U.S., but became a huge hit in England, reaching the top ten in May of '64. Doris Day's life went sideways in the late 1960s. The public tired of the comedies that had become routine by this time. The prim-and-proper characters she typically played led critics to refer to her as "The World's Oldest Virgin," a curious tag considering her three marriages and many relationships. Record sales had slowed to a snail's pace; she and Columbia Records parted ways in 1967. Marty Melcher, her husband of 17 years, had a heart attack and passed away in April 1968 at age 52; it was then she discovered he had lost most of her money making poor investments at the advice of her lawyer, Jerome Rosenthal, who'd been representing her since divorce number two in the late 1940s. She filed a suit against him and won, recouping over 20 million dollars of lost income. With Six You Get Eggroll, released four months after Melcher's death, was Doris's last theatrical film. While mourning her husband's passing and dealing with the resultant lawsuit, she found he had locked her into an agreement with CBS to star in a series...without her permission! She had little or no interest in doing television on a weekly basis but with her financial state in question, she went ahead with it. She insisted on one thing: complete creative control. Bowing to her star power, CBS granted it. 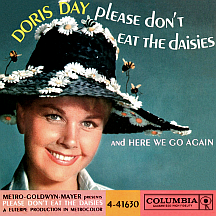 The Doris Day Show, a half-hour comedy, premiered September 24, 1968 with a new, updated recording of "Whatever Will Be, Will Be" as its theme song. Meanwhile, her son, Terry Melcher (born Terry Jorden, he had legally taken the name of his stepfather) had troubles of his own. He'd been making records for Columbia with Bruce Johnston, fronting The Rip Chords ("Hey Little Cobra") and as Bruce and Terry ("Summer Means Fun") while producing a number of acts for the label, including Doris, who released a couple of singles done up "girl group" style (in spite of her being over 40 at the time). Terry became acquainted with aspiring singer-songwriter Charles Manson through mutual friend Brian Wilson of The Beach Boys. An audition led to his rejecting Manson as a potential Columbia act; Manson's reaction to the rebuff led to an alleged attempt on Melcher's life, but he had already moved out of his rented home in L.A.'s Benedict Canyon. Roman Polanski and his wife, Sharon Tate, had rented the house from its owner and the tragic events of August 9, 1969, have been recounted in detail; five were murdered by the notorous "Manson Clan," including Tate, who was eight months pregnant. Terry Melcher, in fear of his life, went into hiding until after the 1970-'71 trial. The TV series kept Doris busy through this time, and as the seasons unfolded, it became clear that this was one sitcom on a different plane from others. In the first season, she lived on a farm with her father, two sons, a housekeeper and a dog. At the start of the second season in 1969, she began commuting to San Francisco to work as a secretary at the fictional Today's World magazine. Season three began with Doris, the boys and the dog moving to the big city and renting an apartment above an Italian restaurant, of all things. Additions to and subtractions from the cast became routine with each season's switch. The fourth season went wacko when she became a staff writer for the magazine...and was suddenly a single career girl, no children, no dog, and no further mention of them! Ratings were strong; viewers simply scratched their heads and rolled with the punches. A few more changes occurred in the fifth season and in 1973 the series came to an end bearing little resemblance to the initial episodes other than the theme song and Doris herself. On March 14, 1971, square in the middle of all this curiosity-piquing premise shifting, she headlined The Doris Mary Anne Kappelhoff Special, with guests Perry Como and her old partner in romantic mayhem, Rock Hudson. After the series went off the air, she focused most of her efforts on a charity she had cofounded a couple of years earlier called Actors and Others for Animals. Ever since then, animal welfare has been her top priority. One final TV special, part of the original agreement with CBS, aired on February 19, 1975. Doris Day Today featured Tim Conway, Rich Little and John Denver as guests and she performed several of her hit songs from the 1950s. Once the show aired and her contract was fulfilled, Doris Day walked away from show business and never looked back.